So you didn't make it to the playa this year? 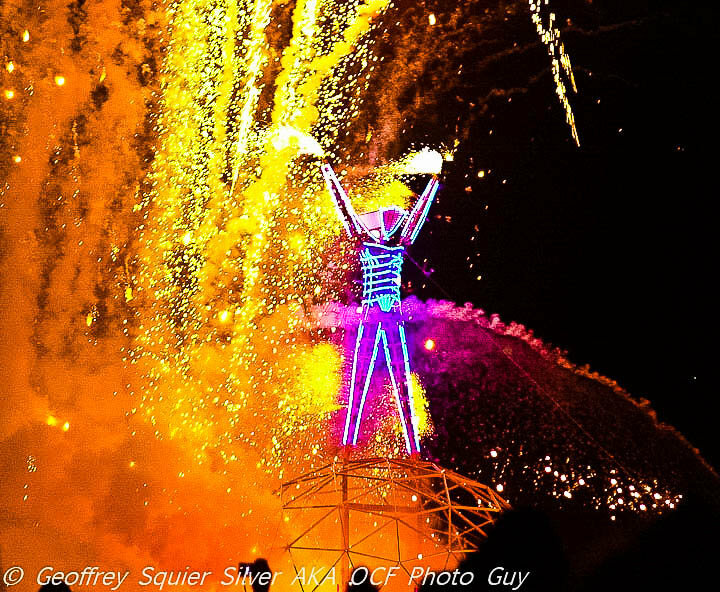 Watch Burning Man live 24/7 by clicking on this link. http://www.ustream.tv/burningman We threw a great party at our house during the burn by playing this video stream live on a big screen and decorating the property and house like our theme camp complete with BlissLights Laser Starfield Projectors inside and out for a magnificent effect. You have to admit that having the hot tub and all the creature comforts nearby can have its advantages. This year art installations on the playa include the Reno Star Cosmic Thistle which has the LS20G-SZ landscape laser projector integrated into its lighting effects. We have collaborated with many theme camps for helping them setting up exciting lighting effects as well as lots of burners who were rushing orders all this last week from our "Burning Man Specials" selections. 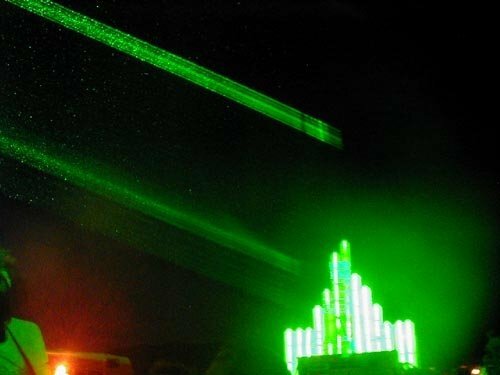 Here is a picture of the fabulous Emerald City with the huge green lasers in 2001 . This was the first time Patrick Flanagan and Randy Johnson brought big lasers to the playa as part of a series of laser projects that indirectly led to the evolution of BlissLights Laser Starfield Projectors which first came to the market at the Mobile Beat DJ convention in Las Vegas in 2007. Since then we have sold thousands of projectors around the USA and the globe. We have projectors in nightclubs, theme parks, meditation centers, healing centers, hospital wards and fine restaurants to name a few of the applications. In 2010 the Spright landscape laser was first built and now thousands of these and the LS20G-SZ moving beam version are decorating homes and landscapes for holiday displays and year round firefly or lightning bug like lighting effects. 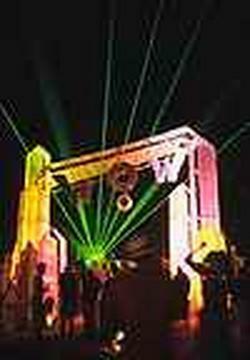 Here is a photo of the entrance to the 2004 Church of WOW esplanade theme camp that also had big lasers and their stage featuring such popular bands as Lost at Last & many others.